Wear Hearing protection and request a noise evaluation if you need to should to be heard by someone three feet away, for extended periods. Contact your EHS Industrial Hygienist to evaluate or measure noise levels. Obey any posted noise hazard signs. Contact Health Services at B 26, x 6266, if you are concerned about hearing loss. 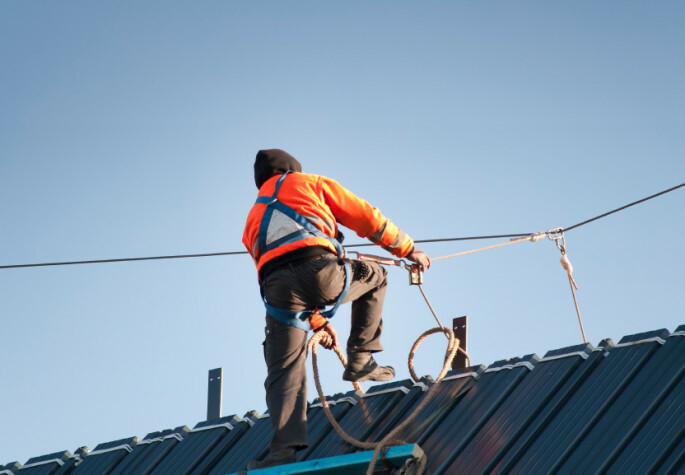 OSHA has leveled almost a half-million dollars in fines to a Philadelphia-area construction company for exposing workers to shock and fall hazards. Two company workers were shocked on the job in 2011 and 2013. In November 2014, OSHA received a report of workers in imminent danger at a construction site in Philadelphia. Inspectors found DMAC Construction LLC workers were allowed to build a scaffold too close to power lines and without properly bracing to prevent a collapse. Less than three weeks later, OSHA was notified of another imminent danger at a second DMAC work site. Workers were laying bricks 35 feet above the ground without fall protection. OSHA cited the company for eight violations, seven of them willful and one repeat, for a total of $470,300. Seven of the citations were for scaffolding violations. One was for failure to develop, implement and maintain a hazard communication program and maintain safety data sheets for employee use. DeJesse was referring to two incidents experienced by DMAC workers in recent years. Two employees received electric shocks in separate incidents in 2011 and 2013. Companies under owner Darren McGee’s control have been cited for more than 40 scaffolding violations since 2008. DMAC and another company under McGee’s control have both been placed in OSHA’s Severe Violator Enforcement Program which mandates follow-up inspections. Facilities Self Assessment - Chemical Management 5-25-11-3. Facilities Division Self 8-15-10 elt-1. Assuring Understanding and Compliance with the LBNL Work Alone Policy. Custodial Self Assessment Final Report. Training stop work order compliance self assessment final report. Self Assessment Penetration Permit Final Report 1-5-12. FA Self Assessment Penetration Permit TAP March 2013. Facilities Division Fleet Maintenance Self Assessment Final Report. Facilities Division Loading Dock Safety Self. If you have a life-threatening emergency. please dial 7-911 or 911 from Lab phones and 911 from a cell phone. If you have an Environment, Health, Safety or Security concern you man communicate with your supervisor first or directly submit a safety concern.